What’s your favorite alternative grip when your putting gets bad? Left-hand low? The claw? The forearm anchor? How many of the best putters on the PGA Tour use some sort of alternative grip in lieu of the traditional reverse-overlap? What’s your guess? 30%? 40%? Higher? 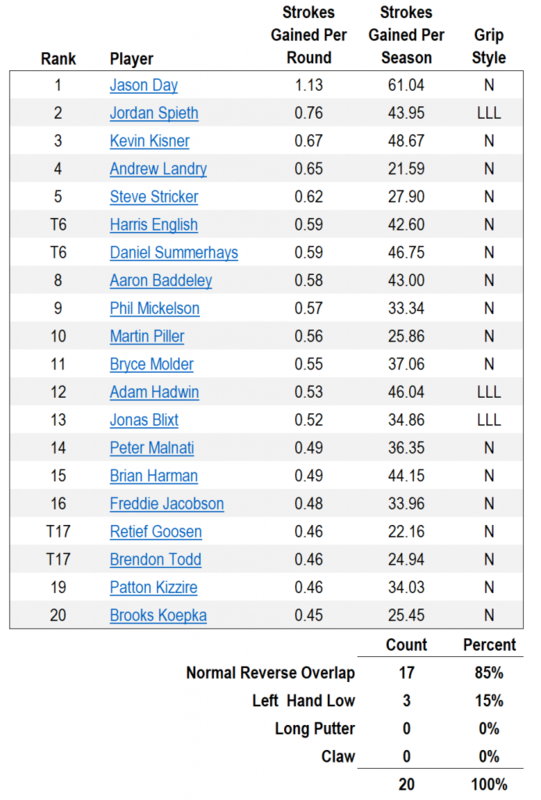 To answer this question I went to the PGA Tour’s website to look up the top-20 players ranked by strokes-gained-putting at the end of the season. Strokes-gained statistics for putting go back to 2004. I then went to YouTube to painstakingly review and catalogue each player’s putting grip. They fell into five categories: (1) the normal reverse-overlap, (2) left-hand low, (3) the long-putter (while it was legal), (4) the claw, and (5) the forearm anchor. I put their names and putting strokes in a spreadsheet and then calculated the percentage of players in each category. The percentage of the best putters using a vanilla ice-cream reverse-overlap grip averaged 86% over the entire 15-year history of recording such a statistic! The reverse-overlap fell below 80% for just 2 years of the 15-year period. During only one year did players using the standard putting grip drop to as low as 70%. Left-hand low was the most popular “alternative grip” but was used on average by only 8% of the best putters. The long putter was used by 5%, and the claw/forearm choice just used by 1%. A short “trend” began to emerge in 2015-2016 where left hand low caught on, no doubt spurred on by the success of Jordan Speith. This trend however didn’t last long before reverting back up to 80%, nearer to its long-term average. So, empirically, the vast majority best putters in the world use a normal reverse-overlap putting grip. 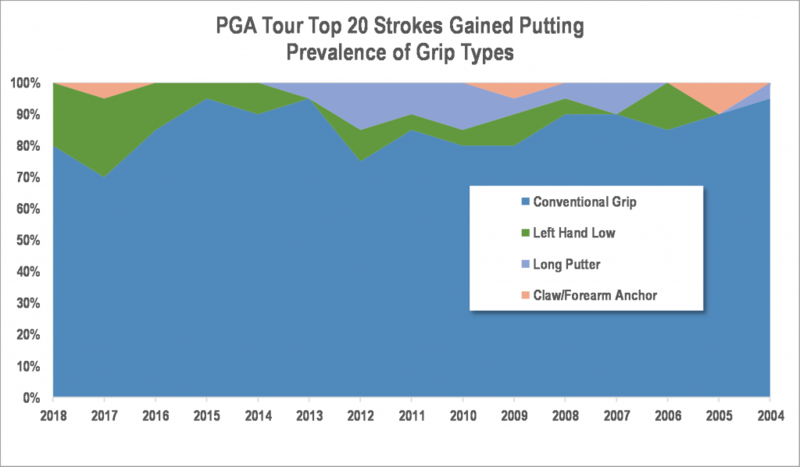 In my opinion, that’s an important statistic to be respectful of before you ditch your traditional putting grip for some sort of alternative style. In my experience, players who aren’t putting well with their reverse-overlap grip are making some sort of mistake somewhere in their stroke mechanics. Generally good putters who go bad are typically making one of two mistakes: (1) they have their right hand up too high on the grip, or (2) their acceleration profile is off. See my post here on how to create a well-formed reverse-overlap grip for the fix to number (1). My post on how to improve number (2) is forthcoming.